Gaming on the go just got easier. Nowhere do I see technology’s relentless progress more these days than in wireless mice. When I was in college, not all that long ago, I had a wireless mouse for traveling. It cost me $30, and it barely worked. As if its error-prone laser sensor wasn’t bad enough, it was always losing connection temporarily—and at the worst moments, of course. It soured me on the whole idea, and for years I defaulted to carrying a wired mouse with me on trips. Usually that meant something by SteelSeries or Corsair, because whatever those companies lack in elegance they make up for in durability. But for the past six months or so I’ve packed a pair of Logitech’s wireless mice on my trips, and honestly I feel like either one is a valuable investment for the travel-prone. Logitech has released two similar models in the last year, the G305 ($60 on Amazon) and the G603 ($70 on Amazon). Besides the slight price difference, the two are distinguishable by features and shape. 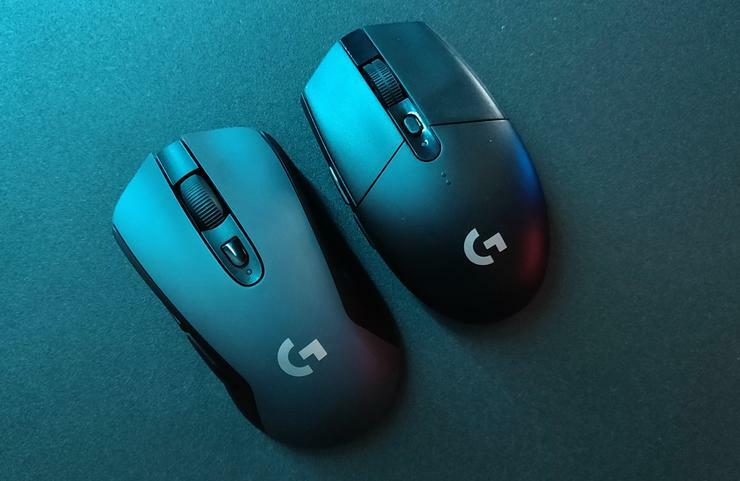 The G603 came first and it’s a familiar shape for Logitech, adopting the neutral right-handed scoop of the G703 (and G403 before it). The main difference is that the G603 runs off two AA batteries, and thus weighs quite a bit more than its rechargeable siblings. It’s a slick mouse though. The buttons and battery compartment are a single molded piece of plastic, held on magnetically. Lift the back edge and this facade pops right out, revealing a slot for the USB dongle as well. Despite that unorthodox design, the G603’s buttons still feel satisfyingly clicky. Will it hold up long-term? Hard to say. There are definitely more points of failure than, say, the more traditional G703’s buttons. That said, I’ve used the G603 for hours and hours, for both casual web browsing and games (from Destiny 2 to Not Tonight), and had no issues, never a mushy click or an accidental double-click. The G305 is less flashy. Sitting lower to the desk, its tear-drop shape is slightly less comfortable and ergonomic. That low hump is a godsend for packing though. The G603 fits in one specific pocket in my bag. The G305 can fit practically anywhere without adding much bulk. It’s small. It also has a more time-tested design. Eschewing the fancy one-piece cover of the G603, the G305 separates the buttons and battery compartment. The rear of the G305 pops off, but the buttons are fastened firmly in place. Inside you’ll find room for a single AA battery, plus a slot for the USB dongle. Otherwise it’s very similar to the G603. Two thumb buttons, DPI switcher, scroll wheel. It’s worth noting that both the G305 and G603 tie into Logitech’s standard software utility too, which means you can program either mouse the same as any of their wired or rechargeable wireless brethren. The real coup though is the sensor. Logitech’s made waves the past few years by sticking its top-tier PWM3366 sensor on wireless mice, like the G703 and G903. Those are rechargeable devices though, and usually meant to last only a few days at most. Neither the G305 nor G603 uses the PWM3366. Instead they use a new proprietary sensor, which Logitech calls the “Hero Sensor.” According to Logitech, Hero is up to many times more power efficient than the PWM3366, but with the same performance—meaning no smoothing, no acceleration, no interference, and up to 12,000 DPI. Hero is Logitech’s flagship sensor going forward too, designed to replace the PWM3366 even on wired mice. This isn’t some compromise for wireless. It’s everything people liked about the PWM3366, but designed to not drain your battery. And that’s evident in the G305 and G603. As I said, the G305 uses a single AA battery, and Logitech claims you’ll get up to 250 hours of use out of it. The G603 and its dual AA batteries get twice that, or 500 hours, in high-performance mode, and you can eke out even more by switching to low-performance mode when not gaming. Neither is necessarily a great choice for your desktop computer. AA batteries are heavy, and while the G305 comes in under 100 grams by opting for a single battery, the weight distribution is still a bit weird. And 250 hours? Or 500 hours? Logitech claims that’s nine months of “typical” use, but in my case it’s more like a month or two. At $60 for the G305 and $70 for the G603, these aren’t cheap mice. There are excellent wired options for the same price, and some solid rechargeable choices for not much more. The G703 for instance is $100. If you’re at a desk all day, it makes way more sense to buy that and plug it in at night than to burn through AAs for no reason. But for traveling? I don’t want to deal with recharging the G703 on the road. I want a mouse that’s always ready, and both the G305 and G603 satisfy that requirement. I’ve taken to leaving the G603 dongle plugged into my laptop all the time, so as soon as it’s out of my bag it’s ready to go. I’ve used both it and the G305 on trains, in hotels—even in the back seat of a car, with a bit of creative mouse pad engineering. And while 250 or 500 hours of battery life doesn’t feel like much at home, it’s an eternity when you’re on the road. Not to mention the fact that it’s easy to find AA batteries almost anywhere. It’s a niche, sure, but a growing one. With gaming laptops more and more affordable, I’d wager a lot of people need roadworthy solutions for playing on-the-go. Both the G305 and G603 are excellent picks, powerful mice that nevertheless last for hours on end on one or two AAs. If I had to choose, I’d probably opt for the G603—it feels more like a proper gaming mouse, and the G305 is a bit small for my tastes. That said, the G305 is lighter and slimmer, and thus more suited to being packed away. It’s a toss-up really, and comes down to personal preference. Both demonstrate how far wireless mice have come in a short span though. Full gaming performance on a single AA? I would’ve killed for that 10 years ago.